FlowTube has many benefits over off-the-shelf products and fabricated equipment. It is also an ideal customised solution to support Lean Manufacturing and other continuous improvement practices. It’s versatile, simple to build, easy to modify and reusable. Simple FlowTube concepts can be sketched on paper following the guidelines in the assembly guide, while more complicated structures can be designed by the FlowTube team, using a sophisticated 3D CAD system. As every FlowTube build is a bespoke solution rather than bought off-the-shelf, it is easy to ensure that the designs are ergonomic and optimised for their intended use. FlowTube structures are incredibly easy to assemble. No special tools are required, just a measuring tape, pipe-cutting tool and 5mm Allen key. Simply cut the tubes to length and bolt the joints together to create your customised solution. Once a FlowTube structure has been built that is only the beginning. As FlowTube is bolted together, it is easy to modify the structure to continually improve the design based on actual rather than theoretical usage. It is also possible to add or remove features to the equipment based on changing product requirements. Almost all FlowTube structures can be mounted on castors for ease of movement. If a FlowTube structure is no longer required it can be disassembled and the parts reused to create something new. FlowTube uses a patented joint design that is optimised for superior grip performance and grip strength is improved by up to 30% (especially if using FlowTube ABS plastic coated tubes). Both tubes and joints are available in a variety of finishes and colours including stainless steel and ESD compatible coatings. FlowTube is a benefit to virtually any aspect of a business considerations, which can impact the bottom line or profitability of a business such as staffing requirements, space requirements, return on investment, investment pay-back period etc. This simple-to-use customised solution gives a highly positive return on investment (ROI) by increasing your productivity, simplifying your processes and decreasing your costs. Customised applications and lean solutions for virtually any business environment can be easily built using FlowTube due its’ highly flexible and robust nature. 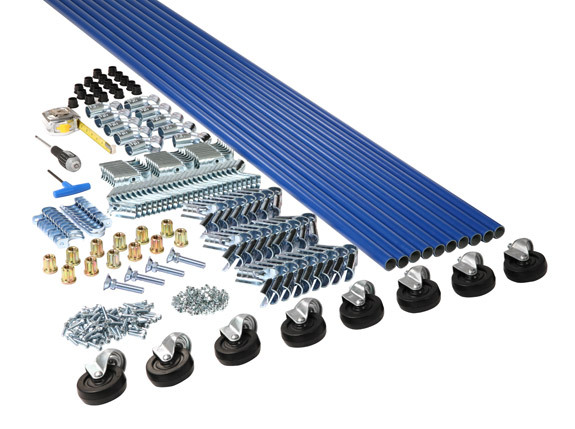 With the comprehensive range of steel tubes, joints and brackets, roller tracks and other accessories, along with the fact the parts are totally reusable, FlowTube is without doubt a massive benefit for both industry and non-industry sectors, especially those embracing continuous improvement practices.